Almost all of the "new" English stations proposed by the Association of Train Operating Companies (Atoc) already have roots in railway history. Towns like Aldridge, Blyth and Wisbech, earmarked for new rail development in plans unveiled by Atoc, had previously enjoyed stations until the British network was drastically reduced in the 1960s, following a report by Dr Richard Beeching. As Atoc plans to reopen the lines to these and other towns, BBC News looks at the rail heritage of six names on the list. Most computers will open PDF documents automatically, but you might need to download Adobe Acrobat Reader. Atoc's plan: Half-hourly services as an extension of the route from Birmingham New Street to Walsall. Summary: Aldridge, near Walsall in the West Midlands, had a passenger service from 1884 to 1965. Although a branch line serving the station was closed and the track removed in the 1960s, a separate line running through the station still carries freight trains. Photos and accounts: DJ Norton took a number of railway-related photographs around Birmingham in the 50s and 60s, including several of Aldridge collected by his son. Rail Around Birmingham shows how the line looked with the station gone. Population (in catchment area): 79,000. Atoc's plan: Hourly services from Newcastle or Metro Centre. Summary: These stations were originally part of Northumberland's Blyth and Tyne Railway, a largely coal-freight line, in the 1800s. The pair were closed to passengers on 2 November 1964. Photos and accounts: Northumbrian Railways has excellent pictures of both Ashington and Blyth in their prime. Population (in catchment area): 11,000. Atoc's plan: Half-hourly services as a development of London Waterloo-Guildford stopping trains. 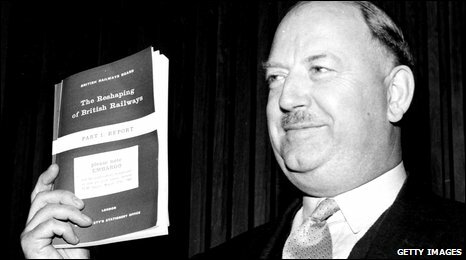 Summary: The "Cranleigh line" in Surrey fell victim to Dr Beeching's report, The Reshaping of British Railways, just four months ahead of its centenary, closing on 12 June 1965. Photos and accounts: The line, including Cranleigh station, has a website dedicated to its memory while Disused Stations has more pictures. Much of the old line can be explored as part of the Downs Link footpath. Atoc's plan: None specified - no new line needed, Kenilworth would be rebuilt on existing passenger line. Summary: Kenilworth, between Coventry and Leamington, opened to passenger services in 1844. A new, larger station was built in 1883, but by January 1965 the station had been closed to both passengers and freight. Photos and accounts: Warwickshire Railways offers a short history of the station and a comprehensive selection of photos, while Windows on Warwickshire offers several more images of the old Kenilworth station. A local campaign group has been active in backing the station's reintroduction. Population (in catchment area): 95,000. Atoc's plan: A new, hourly service from Manchester Victoria to Rawtenstall via Heywood. Summary: Rawtenstall station, in Lancashire, clung to passenger services for several years following Dr Beeching's report, eventually closing in 1972. The last freight service departed in 1980, but the station reopened in 1987 as part of the heritage East Lancashire Railway. Photos and accounts: The East Lancashire Railway's website contains a history of the line as well as links to other relevant pages. Railscot, a site dedicated to the history of Britain's railways, has a selection of older images of the line, and of Rawtenstall station. Population (in catchment area): 50,000. Atoc's plan: A new, hourly service from Wisbech to Peterborough via March. Summary: Wisbech East station was closed to passengers in 1968, despite avoiding a mention in the Beeching Report, and occasional freight services continued to run until 2000. Much of the track itself still remains, and preservation societies have campaigned for the return of passenger services. Photos and accounts: Two sets of photographs show the line in and around Wisbech both in its working days and as it is now. The Bramley Line contains a history of railways in the area.